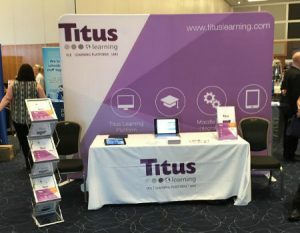 Next week the Titus Learning team will be hitting the road once again to head for the Innovations in Education Conference 2017 which will take place at the Radisson Blu Portman Hotel, London on June 7th. Chaired by Tracee Green, Lecturer in Child Protection at the University of Kent, the one-day conference boasts a line up of expert speakers from leading institutions and tech companies including Microsoft, Google, Konica Minolta, Salford University and the University of Kent. The day will also feature panel sessions and audience Q&As alongside a choice of engaging seminars. The central theme will be discussion of how the latest technology can help engage pupils, enhance the classroom experience and encourage innovative new approaches to teaching – issues which are at the heart of Titus Learning’s approach to e-learning. We’re looking forward to catching up on the latest developments in the space, as well as demonstrating some of the new and innovative developments within our own platform, such as EduLink One. Engage students with quick access to timetables, homework assignments, resources and exam calendars. Involve parents by giving access to grades, attendance and behavioural data, as well as instant messaging to keep them informed. Empower teachers to work flexibly, with real time access to MIS data and marking, assessment and registration accessible on a mobile device. Support administrators via integration with cashless payment systems, and instant messaging directly to students’ and parents’ smartphones. If you’re interested in joining our free trial of EduLink One, please fill out our enquiry form here. For further details of the Innovations in Education Conference programme and booking options, please visit the conference website.